Electricity bills can be knocked off by upto 50% from a switch to gas for water heating. Gas also reduces your carbon footprint by offering a 24×7 reliable off-grid energy choice that is cleaner and cheaper than grid electricity. 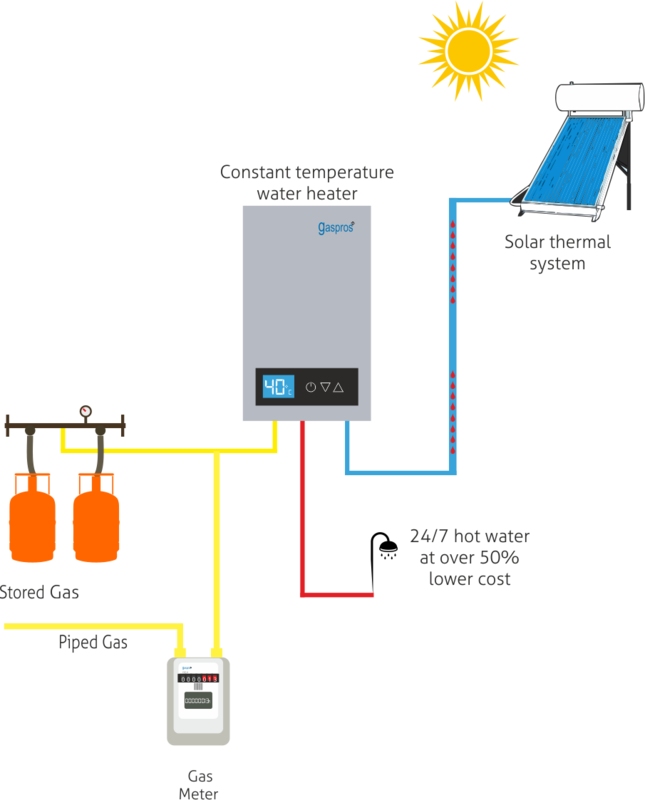 Our smart water heating solutions freely integrate with all solar thermal technologies to build a hybrid gas-centric off-grid super-efficient water heating solution. It works on the principle of Free Energy First. The integration reduces consumption of gas and thereby reduces operating costs further, besides minimising your carbon footprint. All this, while you enjoy uninterrupted, round-the-clock temperature-controlled hot water economically! 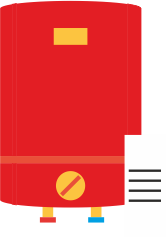 When there is demand for hot water, the gaspros constant temperature gas water heater switches on automatically to deliver hot water at the temperature set by the user. The out let of the solar thermal plant is connected to the water inlet of gas water heater. Water temperature gradually rises at the gas water heater inlet as the hot water from the solar thermal system reaches the gas water heater inlet. A sensor driven system regulates the operation of the gas water heater to ensure hot water delivery at constant temperatures. As the water temperature in the solar tank decreases, the water gas heater comes alive to monitor and maintain constant temperature hot water.